My Stanley #8 that I scored on ebay arrived today. I sharpened the blade and put it to work working out the last few details on the glue faces of the timbers for my bench top. I got them both very flat and twist-free, this plane rocks! Kolya had to try it out, he likes it too. 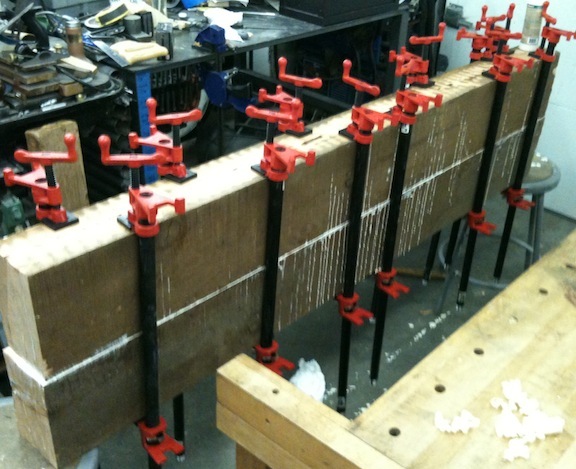 We smeared both faces with too much glue, hoisted the second beam in place and applied clamps. I got the alignment really close, although the wad of glue at the seam makes it look like they are out of alignment. 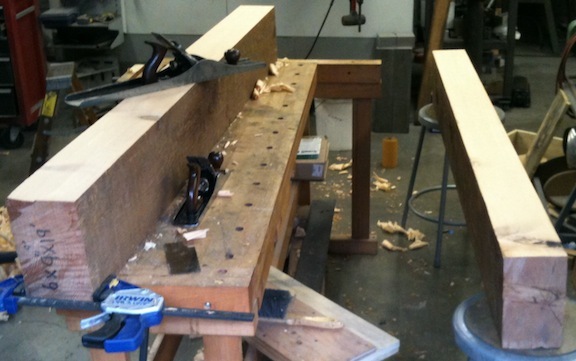 I’ll have to decide on the width soon, but I suspect I’ll be adding the third timber into the top so I end up around 24″ wide.